In a new study published in the scientific journal of repute Nature Communications researchers from the University of Copenhagen have discovered how an enzyme that plays a key role in cancer development functions. The researchers hope the new knowledge will lead to the design of more precise drugs. Researchers are far from understanding how all the proteins and enzymes in the human body function. Now, researchers at the University of Copenhagen have come a bit closer to understanding the behaviour of an enzyme in cells that appears to be important to cancer development. The new study shows that the enzyme METTL13 helps control the formation of new proteins in cells. "Mistakes in the production of proteins are undesirable. We know from other studies that it can result in the development of cancer tumours and degenerative brain disorders like Alzheimer's and Parkinson's. Therefore, the new knowledge of how this enzyme functions is significant," says Professor Jesper Velgaard Olsen from the Novo Nordisk Foundation Center for Protein Research. The enzyme controls protein synthesis by placing so-called methyl marks on a particular protein called eEF1A. "If methyl is not attached correctly to the protein, it will not be able to do its job properly. And that again affects the formation of proteins in the cell, which will take place at a suboptimal pace. Even though that may not sound so bad, it appears to be connected with very serious disorders," says Postdoc Magnus Jakobsson from the Novo Nordisk Foundation Center for Protein Research. 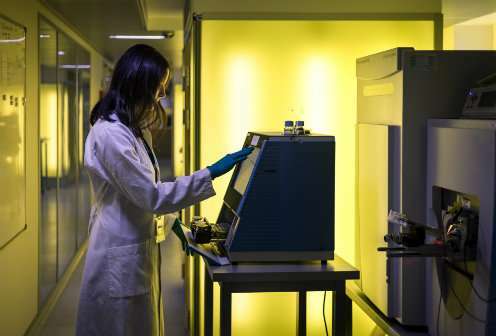 The researchers have shown how the enzyme functions by studying isolated human cancer cells using advanced mass spectrometers, which are able to identify and quantify proteins and their methyl-modifications in a cell. The researchers hope the study will lead to the development of methods and drugs able to target and ensure that the enzyme functions as intended in cells.